ALBANY – Gov. Andrew Cuomo signed legislation Friday that allows Yonkers to create a new authority to oversee its $2 billion reconstruction of the city schools. 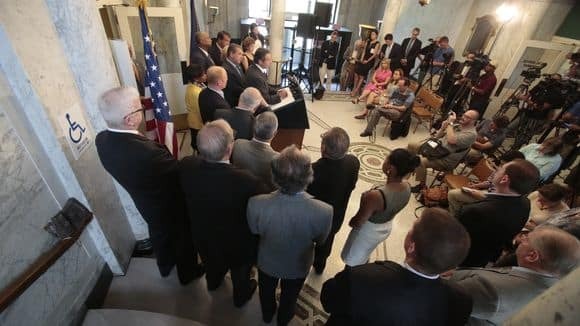 The state Legislature approved the bill in the waning days of the legislative session in June after months of wrangling over how to address the district’s crumbling infrastructure. Yonkers Mayor Mike Spano lobbied the state Legislature — and hired three lobbying firms — to pass a bill that would increase the city’s reimbursement rate for school construction projects, as well as provide more state aid. But those measures weren’t included in the final bill. Assemblywoman Shelley Mayer, D-Yonkers, said it was important for the bill to be signed into law. “It’s great news,” she said Friday. The bill signed by Cuomo creates the Yonkers Joint Schools Construction Board, which can bond for the cost of construction. Spano, a former assemblyman, said he expects the city to return to the Capitol next year to fight for a higher reimbursement rate and state aid. He praised Cuomo’s signature on the bill, saying it can move the project forward. “The governor’s signing of this act signifies our state and city’s commitment to our schools and to the thousands of students in the Yonkers Public Schools whose education will benefit from modern, healthy learning environments,” Spano said in a statement. Yonkers has grappled with crowded classes, growing enrollment and buildings that average about 75 years old. Yonkers is one of the largest districts in the state with about 26,800 students. Its buildings are about 4,500 students over capacity, local officials said. The $2 billion construction plan would allow the city to repair schools over 13 years, but the city said it needs a higher reimbursement rate from the state to complete the work. Yonkers can currently get about 70 percent reimbursement for its capital construction. Local officials were pressing for as high as 98 percent reimbursement — putting it par with the other largest upstate school districts. But since Yonkers doesn’t have the level of poverty as the other districts, the state was reluctant to change reimbursement rate, saying it is tied to formula based on the city’s demographics. So the change in the reimbursement rate was stripped from the final bill. Mayer said the local lawmakers would try again next year in Albany to aid the city schools.